I have tried to make good vegetarian chili many times over the years—and have consistently failed. Instead of hearty and filling, it had always turned out thin, soupy and unsatisfying. We eat lots of soup and I love it—when I intend to make soup. But I don’t like chili soup. So I consulted the expert cook in the family, my daughter MK. A couple of years ago she came up with a delicious recipe for chili on her blog. The secret ingredients? Mushrooms, sweet potatoes and my own spice blend rather than chili powder. Chili is a great example of a versatile use-what’s-on-hand recipe, which both saves you money and reduces waste. Add various vegetables. Chop up carrots and celery and sauté them along with the onions. The recommended onion:carrot:celery ratio for a mirepoix is 2:1:1. But in use-it-up mode, don’t worry too much about that. Corn would taste great in this. Squash would work well in place of the sweet potatoes. Chop up those few kale leaves sitting in the crisper drawer. Have a green onion? Chop it and sprinkle it on top of the chile just as you serve it. Get creative. Add a small amount of grains if you like. Do you have a few spoonfuls of cooked rice in the refrigerator that you need to consume? In they go. Dried bulgur would taste good. Toss a small amount (1/4 cup or 1/2 a cup) in when you add the sweet potatoes and beans. Save water too! This recipe calls for some water. Use just enough to barely cover your vegetables so the chili doesn’t turn out too runny. If you reserve some of the cooking liquid from your beans and use that in place of tap water, you’ll thicken this a bit more while conserving water. 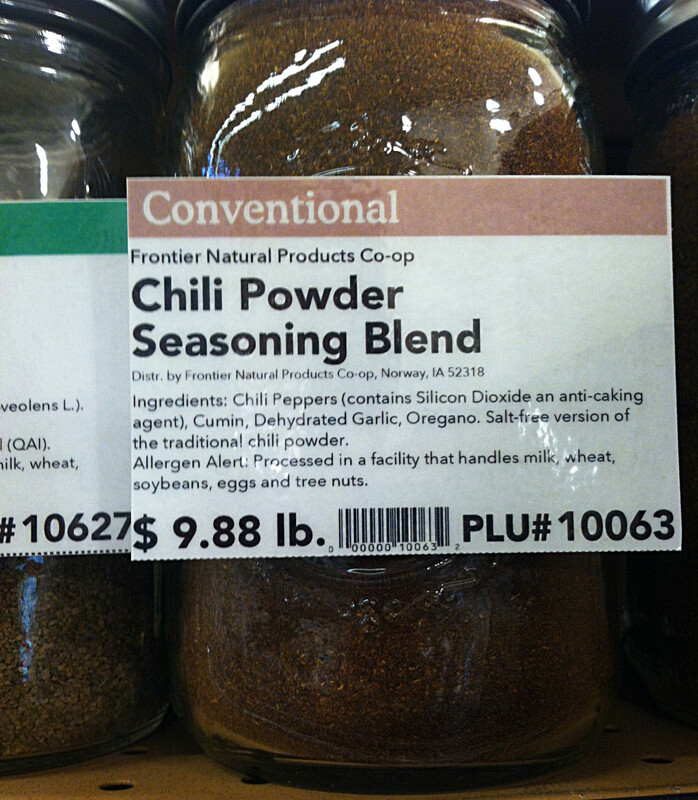 Don’t shell out extra money for chili powder. If you have some standard spices on hand, you don’t need to buy a jar of chili powder too. In the pic below, you can see that organic chili powder at my Whole Foods contains chili powder, cumin, oregano, coriander, garlic (skip it, this recipe calls for fresh), rice concentrate (skip whatever this is), allspice and cloves. 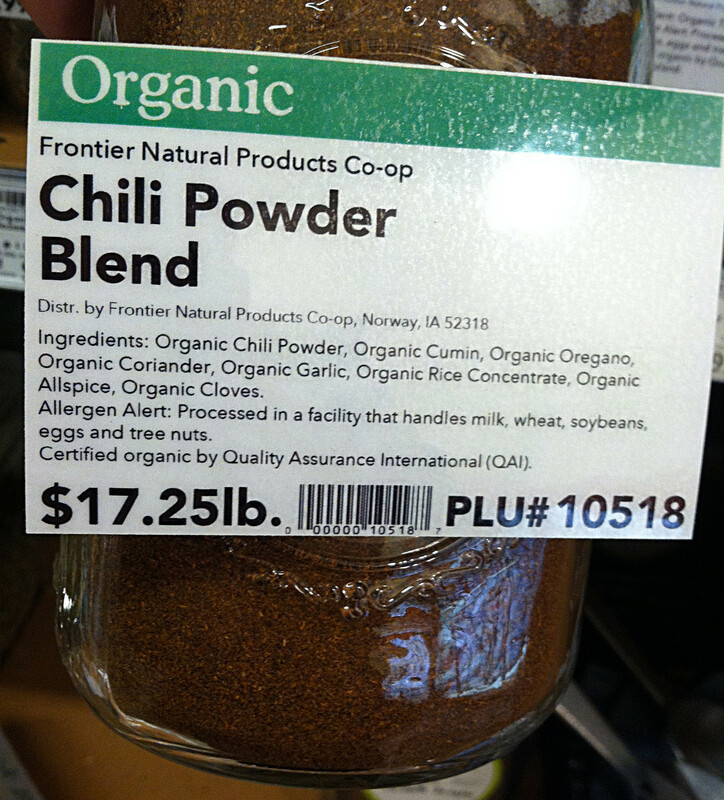 Industrial chili powder contains chili peppers (and silicon dioxide…ummm…no), cumin, garlic and oregano. The spices I use in this recipe taste really, really good. Most of my spices. I buy these in bulk using my mishmash of jars. By buying small amounts that I use up fairly quickly, my spices are fresh. I tweaked MK’s recipe ever so slightly and have posted it here (with her permission). Soak beans for approximately 8 hours. Cook in a pressure cooker, slow cooker or pot on the stove. Drain and reserve the liquid. If using fresh tomatoes, in a perfect world, blanch and peel them. Bring a pot of water to a boil. On the bottom of each tomato, score an X. Boil the tomatoes for one minute, drain and immediately immerse them in a bowl of ice water. Peel and chop roughly. Add garlic and cook for a minute, stirring. Add spices and cook for a minute, stirring. Add mushrooms and cook for about 10 minutes until the moisture is released. For fresh tomatoes, add and cook until they’ve broken down a bit, about 5 minutes. For roasted tomatoes, add and move on to the next step. Add the kidney beans, sweet potatoes, salt and just enough of the bean water to barely cover everything. Bring to a boil, reduce heat, cover and simmer for 40 minutes or until the sweet potatoes are tender. In the winter, I use tomatoes that I've roasted and frozen in glass jars. I cut small tomatoes into halves or quarters, arrange them on a cookie sheet and roast at 275 degrees F for 1 1/2 to 2 hours until they are softened and sweet. I then pack them in jars and freeze them. These replace any need for canned tomatoes. 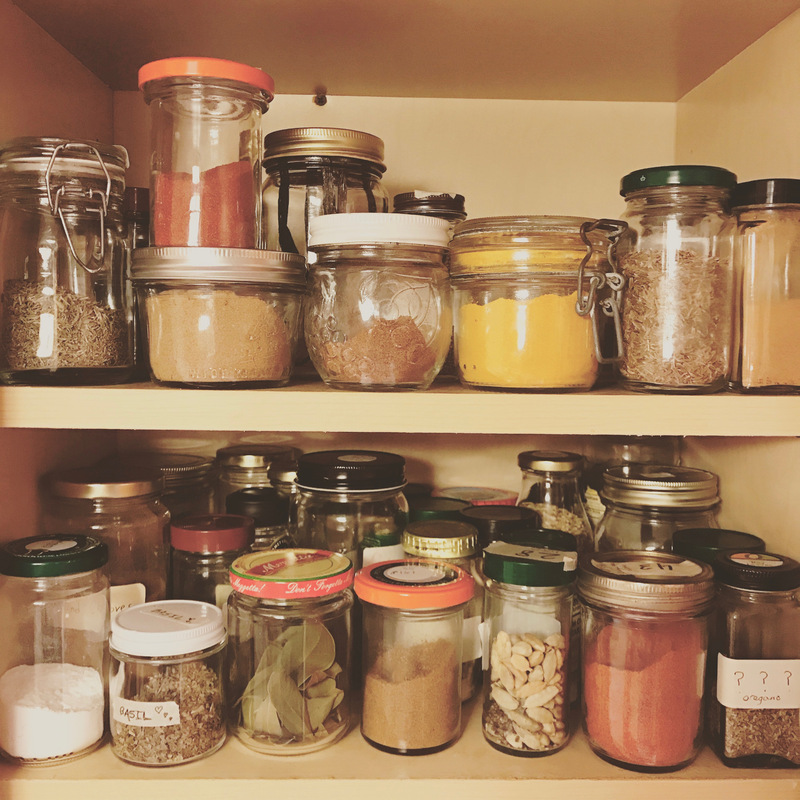 I make my own chili powder and keep it in my spice cabinet – paprika, cumin, oregano, salt, pepper, cayenne. Sweet potatoes and black beans pair splendidly in chili. That’s a great idea Becky. Then you can just grab it. I think I’ll do that for my dal spices–premix them. I was out of paprika when I made this but will add some next time. Yum. Sweet potatoes = brilliant tip! I made this at the weekend for a bunch of hungry teenagers (not vegetarians) and it went down a storm, so thank you! My pleasure! That is the ultimate test–feeding it to non-vegetarian teenagers. I’m glad they liked it! It looks delicious! Thanks for sharing. I’m looking forward to giving this one a go.